Epigenetic metabolic pathways mapped that regulate the macrophage’s role in immune response. A group of researchers from Washington University, Agios Pharmaceuticals and ITMO University has discovered new metabolic mechanisms that regulate macrophage polarization, the unique ability of these immune cells to change their specialization depending on the required task. The research opens new possibilities for the development of a new class of drugs based on controlling the metabolism of immune cells. The opensource study is published in the journal Immunity. One of the key properties of macrophages is their ability to assume different states in accordance with the environmental factors. For example, resident macrophages (M0) can undergo classical activation and transform into proinflammatory macrophages (M1) that by all means seek to destroy pathogens. There exists, however, an alternative activation procedure, wherein macrophages acquire an anti-inflammatory healing function (M2). Understanding these processes is extremely important for understanding the immune system as a whole as well as for fighting autoimmune diseases. The team state that macrophage polarization is accompanied by changes on both transcriptional and metabolic levels. Activation significantly alters the expression of some genes and the concentration of used and produced compounds. While some aspects of activation are known, until recently, the big picture remained elusive. To study macrophage polarization, the scientists developed the method of non-targeted analysis of metabolic changes based on data obtained from the simultaneous use of RNA sequencing and high-throughput mass spectrometry of metabolites. The researchers combined the data on the basis of the network of biochemical reactions, which allowed them to identify the most significant of the ongoing reactions. The final set of reactions revealed unknown metabolic mechanisms associated with macrophage polarization. Based on this information, the team determined the most probable metabolic pathways that manifest themselves in classical and alternative activations. The pathways were confirmed using 13C and 15N isotope labeling and pharmacological inhibition experiments. One of the new mechanisms described in the work is the dependence of alternative macrophage activation on glutamine concentration in the environment, which regulates the activity of TCA cycle, and the synthesis of UDP-Glc-Nac – the compound necessary for post-translational protein modification. In essence the team have developed a method of simultaneous analysis of metabolic and transcriptional data in the current study. The method proved to be effective and, most importantly, yielded a concrete biological result. Now the researchers will continue to improve the method and apply it to other biological tasks such as studying cancer metabolism. The team summise that in the long run, the ability to regulate pro- and anti-inflammatory activity can lead to the creation of a new class of drugs based on controlling the metabolism of immune cells. For the first time, macrophage polarization was described in such detail and on such a scale. The work made it possible not only to reveal new regulatory mechanisms of polarization, but also identify and describe the global restructuration of metabolic pathways during polarization. The researchers hope their work will give new impetus to the investigation of pharmacological potential of polarization regulators, which also represents the next step in the collaborative work of the group. 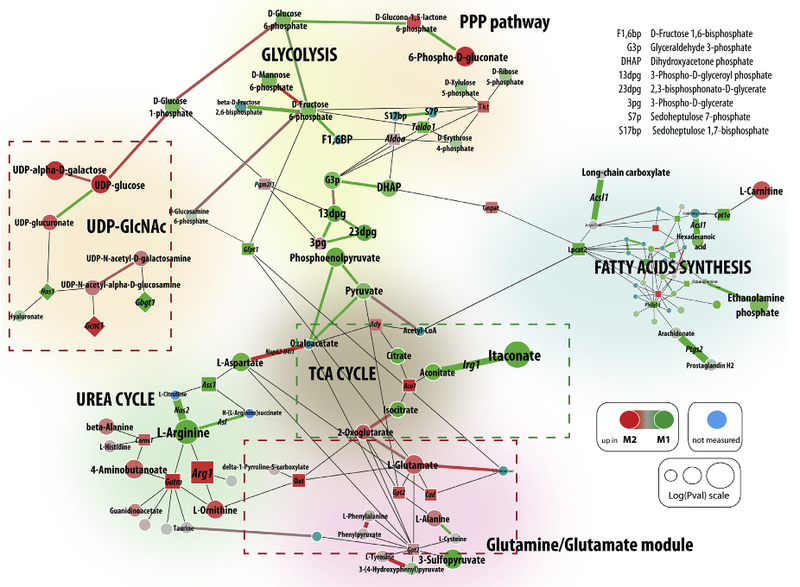 Major Metabolic Modules Are Rewired during Macrophage Polarization CoMBI-T reveals the most regulated subnetwork within global murine metabolic network that consists of more than 2,000 enzymes and metabolites measured through the CoMBI-T profiling pipeline. For comparison between M1- and M2-polarized macrophages, the most regulated metabolic subnetwork encompasses seven distinct modules highlighted by distinct background shading. Three major novel features of macrophage polarization identified by CoMBI-T are highlighted with dotted line squares—green for M1-specific module and red for M2. Round nodes represent metabolites within core regulatory network. Enzymes are represented by square nodes. Differential expression of corresponding enzyme/metabolite is indicated by the size of the node, and fold-change by red (M2) to green (M1) color scale. Enzymes in reactions with single product-substrate pair are represented by edges for visual convenience with thickness and color of the edge reflecting –log(p) and fold-change of differential expression correspondingly. For visual convenience, nodes of fatty acid synthesis module are not labeled. Network Integration of Parallel Metabolic and Transcriptional Data Reveals Metabolic Modules that Regulate Macrophage Polarization. Driggers et al 2015.